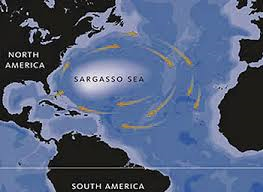 The Sargasso Sea is a region of the North Atlantic surrounded by ocean currents. Its limits are roughly 70-40° W and 25-35° N. It has a number of remarkable features, (i) it is very salty, (ii) it contains masses of seaweed of the genus ‘Sargassum’, giving the region its name, and (iii) it is place where the European eel migrates to, in order lay their eggs. The spawning habits of the European eel are indeed a mystery! Chedomille Mijatovich, the Serbian politician was probably one of the first to associate the Sargasso Sea with Plato’s ‘shoal of mud’ in a letter to Hyde Clarke. In 1925 Dr. A. Selwyn Brown wrote an article in the New York Herald, which was relayed around the world(a) in which he supported the Sargasso Atlantis theory. Around the same period the American naturalist, William Beebe, following an intensive study of the Sargasso was also reported(b) to have suscribed to the idea of the Sargasso as the location of Atlantis. It is obvious that the Sargasso Sea is centred to the west of the Mid-Atlantic Ridge and not over it as implied by some writers, particularly those who want to link it with an Atlantis situated on the MAR. Clearly, Plato’s account of the aftermath of the sinking of Atlantis describes impassable waters due to mud not seaweed. Contrary to popular belief the Sargasso Sea is not a hindrance to navigation.